Luckily, Spectyr is one of the books that manages to avoid this problem: and adeptly keeps the length to a minimum as well, making it a fast and engaging read - free of bloat. So if you think Robert Jordan-esque volume is all there is to the genre, think again! So, let's go for our summary. Again, we begin with our paired protagonists: the Deacons, Sorcha Faris and Merrick Chambers.Now experiencing the rather petty enmity of the new Abbot, they haven't got a chance of being let near an actual geist: stuck instead with the rumours. (...The sort of rumours that happen in real life as well - what with all of the 999 calls for zombie attacks...). Nevertheless, when they learn that there's a potential threat to Raed Rossin, Pretender to the throne - and Sorcha's romantic interest - they manage to trick their way to a posting where they can help. Because the Emperor's sister has released a goddess. Or rather. a geistlord that wants its rival, the Rossin, dead. The characters are as entertaining as always: their interactions, especially with some personal acquaintances thrown into the mix, make Spectyr a constantly-surprising read! The gradual change in the Emperor's sister under the goddess' influence is also achieved well, as are the motives of the geistlords - often human emotions taken to extremes. What can I say? It's good to see the often stereotypical summoned 'demons' gain some actual motives rather than just 'for the evil!'. All in all? 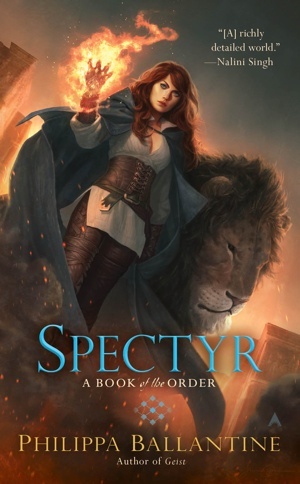 Though without the surprise value of Geist, Spectyr keeps up the series' promise: well-crafted, tightly packed action, interspersed with clues to worldbuilding which should satisfy even die-hard fantasy fans. While Geist took us into the action, Spectyr is keeping us there: waiting for Wrayth. Read this book, or have something to say? Comment below and tell me!